In what seems like week 759 of the European referendum debate we can finally see the finishing line in front of us. It is now just a matter of days until the biggest bun fight in the history of modern British politics comes to its crescendo and it seems that a large sector of the public are beginning to wake up. Last week saw a mad rush created by hundreds of thousands of Johnny Come Latelys who finally realised there is something quite important happening next Thursday, presumably after tearing themselves away from dancing kangaroos on YouTube or Call of Duty. Much was made of the fact that these tardy folk created a lot of extra work, all because they left it until the 11th hour to register to vote. While it is slightly absurd that grown ups cannot do a simple thing such as enabling themselves to take part in the democratic process, it is hard to blame some of the electorate for feeling disenfranchised as the level of debate during this campaign has been nothing short of turgid. The phrase ‘the only thing we know is we don’t know’ has been trotted out a lot recently in relation to this issue but that isn’t completely true as another thing which has been confirmed during the greatest in or out saga since the hokey cokey was in the charts, is that we are seriously lacking on the political talent front in this country. We are currently living in a period of history which is likely to be poured over for years to come and should be the ideal forum for politicians to display their vast array of skills. 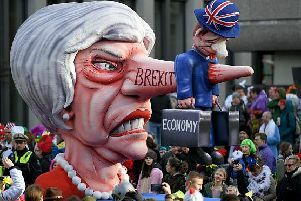 But, with a few notable exceptions, we have been subjected to months of bluster and weak soundbites from self interested politicians who have failed miserably to convince millions which way they should go on June 23. That every other person I speak to decries the lack of facts in the debate speaks volumes for the shambles of the process as there was an ideal opportunity for somebody to grab the Brexit bull by the horns and put forward a compelling case for either side. Instead the major players have resorted to binary, Punch and Judy politics: the very thing David Cameron promised he would eradicate from public life when he became Tory leader 11 years ago. At the beginning of the campaign I warned about the danger of boring the electorate with an uninspiring campaign and a high profile Remain campaigner wrote to me to tell me how wrong I was. In the incredibly polite rebuke I was told how important this issue was, as if my suggestion that the discussion had become moribund undermined the entire democratic process. Sadly, my prediction that this banality could lead to apathy seems to be coming true and the danger is that voters will make snap decisions which they come to regret in years to come. The debate is sinking to the level of a playground cat fight with would-be Brexiters being asked whether they really want to be on the same side as Nigel Farage, Michael Gove or Katie Hopkins, overlooking the fact that Messrs Cameron, Osborne and Cowell support staying in. These childish questions are being asked because there is a void where there should be guidance and, dare I say it, leadership. I fear that 2016 will be long remembered for being the year that the British public was let down by its mediocre elected representatives.